Well, it was hump day for sure. We both started the day a bit sore and tired. The adrenaline from the first two days had worn off and the reality of backpacking had set in. We were thankful to Jen and Em from the night before for prepping the water ahead of time. 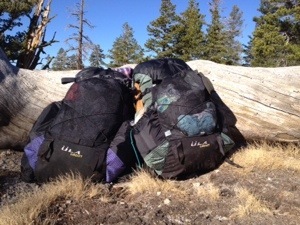 I climbed out of my sleeping bag to let down the bear bag and bring breakfast back to the tent. 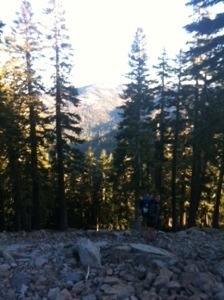 I crawled back into my sleeping bag and we drank our breakfast in warmth before breaking down camp. This morning was a bit colder than the previous and while there was no frost on the tent it was still quite chilly! Our camp was in the shelter of trees and the sun was still too low to even cast shadows. We started out the day with layers still on, and set off down the trail. 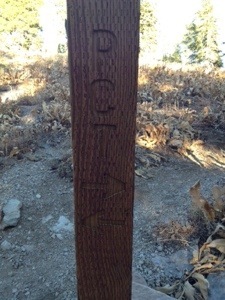 Jen and I have a nice rhythm when hiking. One leads, then we break, then the other leads. Today we made sure our first break was on a peak in the open for the sun was still climbing. It is pretty noticeable at altitude. In the sun you are warm an in the shade you are not. Today’s terrain was quite varied. 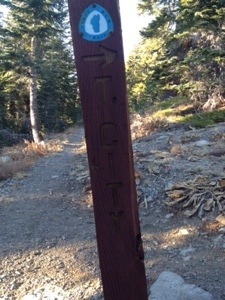 We went from straight up rocks, to dirt path, to fire road. We struggled. Our bodies were tired and we were feeling the miles as we did them. When we stopped for lunch there was a lot of stretching and flopping about. Maybe even some moans and grumbles about the current state of legs. I also think we both took some Ibuprofen to help with recovery. However, we never complained. We made statements and observations but we never once complained. Our afternoon was full of more difficult terrain, but also some fantastic views well worth the miles. 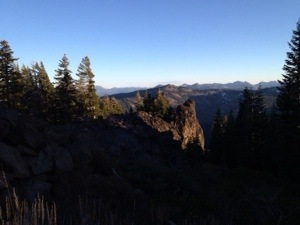 We were afforded multiple views of Lake Tahoe, some beautiful mountains, and a fantastic ridge. 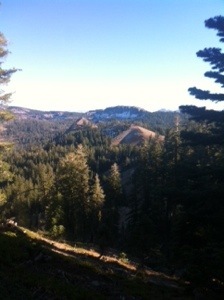 We hiked through some snow fields, parted with the PCT, and ended the day with a 1500+ Ft climb. Our camp was on a knob overlooking the lake with a magnificent sunset. Pictures here were taken with the camera not the phone so they will be uploaded later. Sorry for the tease, but trust me when I say it was beautiful. We had exerted ourselves quite a bit on the climb and we cooled off fast. We set up the tent quickly and ate our dehydrated dinner of beans and rice with tortillas inside the those trusty nylon walls. With full bellies we bundled up and zipped in. The sun was setting and were ready to sleep. After a few recollections and observations about the day, we looked at the map and made our plans for tomorrow. We both groaned a bit as we made sure our alarms were set for early, and within minutes of the sun setting we were asleep. Great progress, Ladies! The Colorado Rockies are like that…up above 5,000 feet and up when the sun is out it gets warm quickly and cold when it falls. Be careful about UV exposure with sun screen. Up that high you are getting a double dose as there is little atmosphere scrubbing it off and you get a full shot on your skin. People in Colorado at 5-10,000 feet use a lot of sun screen so their skin does not age or get cancers later.